I love this conditioner! I cannot believe that I have only this year discovered it – I think that it is definitely right up there with my most favourite haircare products ever! It’s very light, so perfect for finer hair like mine, but also very very conditioning, so great if your hair is coloured, chemically-treated or a little damaged. If you’re looking for very intense nourishment then you’d need to turn to a dedicated treatment mask, but for everyday conditioning this No Scent No Colour Conditioner is just superb. I make a habit of never really reading too much blurb on a product before I test it – of course, I read the instructions and the basics, but I try not to get sucked into the “sales speak”. I like to try something without preconceptions (though that is very difficult) and just muddle along with it to see if it agrees with me. 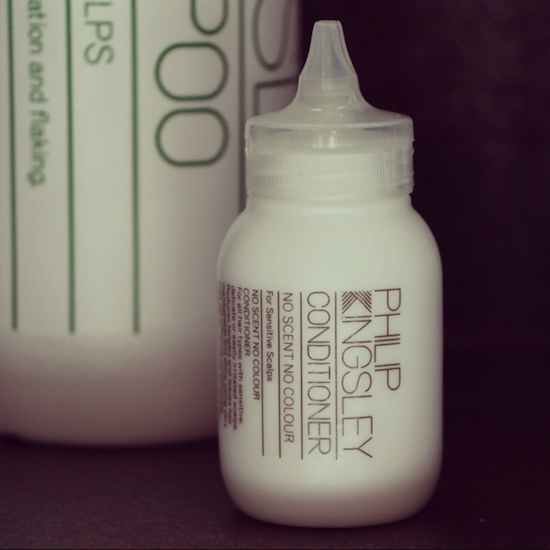 Well hello Phillip Kingsley, you hair God: I don’t think that you’ve brought out a single product yet that hasn’t agreed with me! I generally use the No Scent No Colour Conditioner after I’ve done a dose of the Flaky Itchy Scalp Shampoo (another hero product of mine, find it here) but it works well after any shampoo, really. It doesn’t feel heavy on the hair and it rinses out perfectly clean to give light, soft shine. Marvellous stuff. Right, I’ve just read the blurb – the “sales-speak”: apparently it’s suitable for those with even the most sensitive, delicate or easily irritated skin and scalps. It has been designed to answer the needs of the growing number of allergic and reactive skin types for whom fragrance and strong surfactants are not an option, it is fragrance, colour, SLS and paraban free. Gentle enough for those undergoing chemo/radiation therapy and it is also suitable for those who have had Brazilian Keratin treatments. Pretty good, eh? Just reaffirms how much I love it, really. I only had a tiny bottle but will now be ordering the humungous one litre version for £38.50 because it works out to be great value. The little trial size is about £6 and there’s a 250ml too – you can find them all at FeelUnique.com with free delivery.